A majority of the road accidents occur due to driver’s distraction or negligence. Rising awareness among people and governments of nations across the world to ensure public safety and security by undertaking efforts to reduce road accidents, caused primarily due to driver negligence and distraction is a major factor that is likely to drive the lane keep assist system market. In a few states in the U.S. such as California and Nevada and in the District of Columbia, a rule stated by the U.S. government, mandates autonomous vehicles or vehicles with lane keep assist system to be equipped with an easy to trigger auto-drive disengage switch and an alert system for system failures. Increasing public preference and government emphasis toward advanced driver assistance systems (ADAS) equipped vehicles in recent years due to safety and security concern is also expected to boost the global lane keep assist system market during the forecast period. The lane keep assist system faces a few drawbacks, despite its numerous advantages. The entire system is operated by an electronic processing unit and positioning system, which faces a threat of cyber-attack and hacking. A hacker of the electronic processing can directly gain complete control over the operation of the vehicle, which can pose a threat to human life. Furthermore, the sensors of the lane keep assist system are unable to detect faded lane markings and the lane keep assist system does not work properly in extreme environmental conditions such as fog, rain, or snow. These minor drawbacks are likely to hamper the lane keep assist system market to some extent during the forecast period. The electronic Control Unit (ECU) component segment is responsible for the actions performed by the lane keep assist system, and hence, is expected to offer lucrative opportunities, thereby boosting the global lane keep assist system market during the forecast period. ECU reduces the convolution of the system, by receiving the data from sensors and converting it into readable format. Hence, it is expected to witness significant expansion by 2025. The aftermarket sales channel segment holds a prominent share of the lane keep assist system market, as compared to the other segments, owing to the higher rate of adoption and shorter life of electronic components such as sensors and wirings. The aftermarket segment is also likely to expand at a considerable growth rate during the forecast period due to the safety concerns especially in passenger vehicle. Malfunction of the components is a major factor that drives the aftermarket segment. The passenger vehicles segment held a major share of the market in 2016. This high market share held by the passenger vehicles segment is primarily ascribed to the increasing demand for passenger vehicles globally, primarily for local and intercity transport. In hilly areas, distraction of the driver or anxiety in drive handling is likely to drive the vehicle outside the detected lane, which is anticipated to lead to major damage to both vehicle user and vehicle. Such incidents are avoided by the lane keep assist system, as it guides the vehicle within the lane by slightly wringing the steering wheel. Lane keep assist system works to maintain the position of the vehicle in the center of a detected lane, thereby avoiding collision or accident. The lane keep assist system market has been classified into five prominent regions. Among them, Europe dominated the global market, accounting for 44.04% share in 2016. This is due to the rise in safety awareness and increased number of accidents which have led to the high rate of adoption of the lane keep assist technology in the region. This trend is expected to continue during the forecast period. 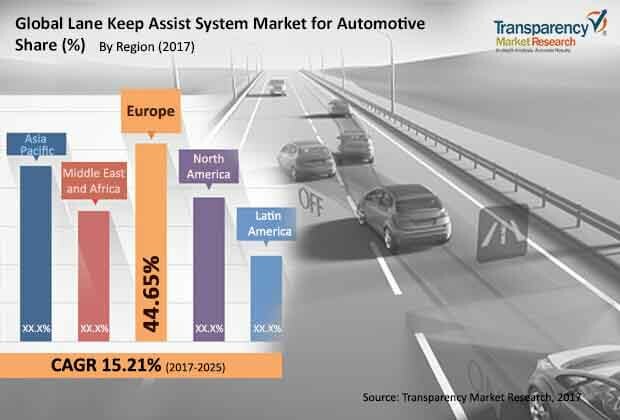 Europe being home to major automotive manufacturers is expected to remain a key market of the global lane keep assist system. Growing technologies on safety features and availability of raw components are expected to break through the demand for lane keep assist system during the forecast period. Advance driver assistance system being the safety trend, cheers to European Union policies are expected to boost the demand for active safety systems such lane keep assist system. Auto manufacturers in this region are creating exertions on account of safety application by providing lane keep assist system as an optional or standard in premium and luxurious cars. The global lane keep assist system market is highly competitive due to the presence of top manufacturers. Prominent players operating in the lane keep assist system market includes Robert Bosch GmbH, Denso Corporation, Delphi Automotive PLC., Continental AG, Valeo, and ZF Friedrichshafen AG. Among these Robert Bosch GmbH and Continental AG are major suppliers of lane keep assist systems. Research and development in the field of driver assistance system and forming joint ventures have boosted the sales of Robert Bosch GmbH for lane keep assist systems. Progress and expansion in regions and development of next generation active safety system increases the market share for Robert Bosch GmbH. Research and development in the field of automation and vision for autonomous or driverless vehicles, which possess numerous advantage such as reduced driver efforts and increased passenger comfort, are providing lucrative opportunities to auto manufacturers across the globe. This report analyzes and forecasts the market for lane keep assist system at the global and regional level. The market has been forecast, based on revenue (US$ Mn) and volume (million units) from 2017 to 2025. The study includes drivers and restraints of the global lane keep assist system market for automotive. It also covers the impact of these drivers and restraints on the demand for lane keep assist systems during the forecast period. The report also highlights opportunities in the lane keep assist system for automotive market at the global and regional level. The report comprises a detailed value chain analysis, which provides a comprehensive view of the global lane keep assist system market for automotive. The Porter’s Five forces model for the lane keep assist system market for automotive has also been included to help understand the competitive landscape in the market. The study encompasses market attractiveness analysis, wherein end-users are benchmarked based on their market size, growth rate, and general attractiveness. The study provides a decisive view of the global lane keep assist system markeat for automotive, by segmenting it in terms of component, sales channel, vehicle type, and region. These segments have been analyzed based on present and future trends. Regional segmentation includes the current and forecast demand for lane keep assist system in North America, Europe, Asia Pacific, Latin America, and Middle East & Africa. The report also covers demand for individual application segments in all the regions. The study includes profiles of major companies operating in the global lane keep assist system market for automotive. Key players operating in the lane keep assist system market for automotive include Robert Bosch GmBH, Denso Corporation, Delphi Automotive PLC., Continental AG, Valeo, ZF Friedrichshafen Ag, Hitachi Ltd., Preco Electronics, Mobileye, Velodyne LiDAR, Inc., Ficosa International SA and Gentex Corporation. Market players have been profiled in terms of attributes such as company overview, financial overview, business strategies, recent developments, and SWOT analysis. The market for lane keep assist system is primarily driven by the rising demand for non-polluting alternative. The report provides the estimated market size of lane keep assist system for 2016, and forecast for the next nine years. The global market size of lane keep assist system has been provided in terms of revenue and volume. Market numbers have been estimated based on key component, sales channel, vehicle type, and regional segments of lane keep assist system for automotive market. Market size and forecast for each major component, sales channel, and vehicle type have been provided in terms of global and regional/country markets.